The Earned Income Tax Credit Coalition is offering free help to low and moderate income workers in San Diego County with a focus on making sure they get every deduction and credit available to maximize their refunds. 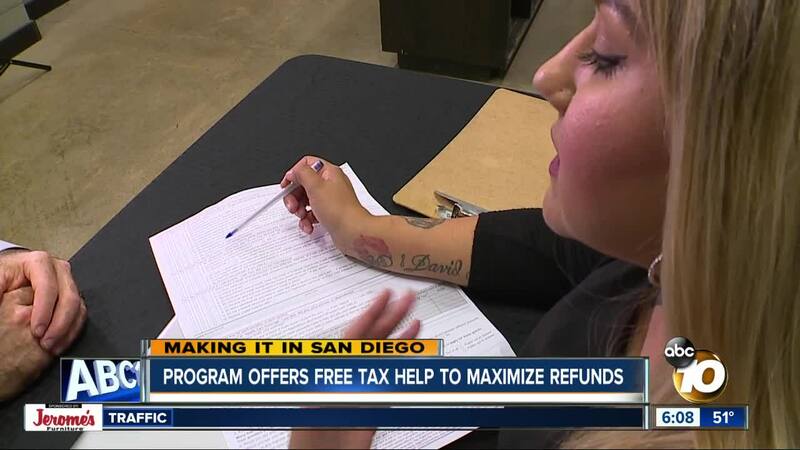 SAN DIEGO (KGTV) - A group of nonprofits is helping low and moderate income San Diego families maximize their tax refunds by putting a special focus on deductions and credits. The Earned Income Tax Credit Coalition, led by the United Way San Diego County, will have more than five dozen tax prep sites set up through the filing deadline to give people free tax preparation and filing services, and to help people make sure they're getting every deduction they deserve. "Sometimes it can be very daunting to think about doing your tax returns, figuring out all the lines and what they mean," says United Way San Diego County President and CEO Nancy Sasaki. "Having someone who's a trained professional can help you through that free of charge and get a better return than you might have gotten on your own." The coalition focuses specifically on the EITC, a tax credit available to low and moderate income earners. Eligibility levels vary based on several factors, including filing status and number of children claimed as dependents. Sasaki says that's one reason why many people don't know if they can get it or not. She recommends that anyone making less than $66,000 a year contact the coalition for an appointment to see if they're eligible . They can also call 2-1-1 or go to the website MyFreeTaxes.org . Last year, 31,092 people in San Diego County had their taxes filed through the Coalition. All told, they received over $40 million in federal and state tax refunds. That included more than $14 million just from the EITC. They also got free tax preparation services, saving each person an estimated $250. For many families, that money helps make ends meet. "We know they're using it towards the rent, they're buying groceries, it's bridging gaps in their budget to help them survive and live in our community in San Diego," says Dreams for Change CEO Teresa Smith. Her group worth with people in extreme poverty and is part of the Coalition. That was the case for Melissa Jamieson, an SDSU student and mother of five who has used the EITC Coalition to file her taxes for the past three years. "I just didn't think that it was for me," she says. "I thought it was different people, or I didn't make enough money, or made too much money, no matter what my income was. When I found out about this program, it really does make a difference." Now, Jamieson is one of the volunteers helping others file their taxes. "We've had people cry, we've had people hug us and just say how awesome we are," she says. "It makes a huge difference to see those smiles on their faces when they're getting thousands of dollars back for the first time, or even hundreds of dollars they didn't know they're entitled to." While the numbers from last year are impressive. Sasaki says they're only a drop in the bucket compared to what's available. The IRS estimates that more than 300,000 San Diego County families would qualify for the EITC. That means nearly 270,000 San Diego families left money on the table last year. A lot of that comes from the fact that many people who don't make enough money to file taxes also don't realize they're eligible for the credit and the refund that comes with it. In addition to the tax filing services, the Coalition also screens families for other benefits available to them. That includes Temporary Assistance for Needy Families (TANF), Home Energy Assistance Program (HEAP), Cal Fresh, WIC, free or reduced school meals, subsidized child care, health insurance programs, and Head Start programs.